The Superbird Wing Was Not "Idiotically-Ineffective" or "Dumb"
A recent article on car spoilers from Quora (“The best answer to any question”) was reposted on Oppositelock and its author called the Superbird wing “idiotically-ineffective” and “dumb” because he does not understand how it works. His answer was dumb. I have never read anything before by Ryan Carlyle and he might very well be the best “subsea hydraulics engineer” alive. But he answers questions on Quora and does not limit himself to topics in which he is an expert. Someone asked how effective spoilers and wings are on street cars and he answered that they are really not all that effective. He explained the differences between wings and spoilers and noted that major strides have been made in automotive aerodynamics in the last few years - much of it in the field of racing. But is the wing “idiotically-ineffective”? Was it based on flawed prehistoric thinking on the part of its designers? No. I am currently finishing a book on the winged car project at Chrysler - covering both the Charger Daytona and the Plymouth Superbird. In my research on this subject (which I have been working on periodically for more than ten years) I have interviewed dozens of people who were involved in designing, testing, building, and racing the winged cars. A great number of them were engineers. Many had backgrounds in aerodynamics. Their “understanding of airstream behavior” was much greater than Carlyle gave them credit for. Before 1969, Chrysler had a major problem in NASCAR. As their Hemi-powered cars pushed through the air faster they became unstable. The cars had gotten to the point where aerodynamics became just as important as horsepower. Chrysler racing called in some engineers, including a few recent transplants from their missile division, and asked what they could do to make the cars go faster and handle better at higher speeds. At least two engineers suggested putting a nosecone on the front of the car (to solve problems with the flat grille and too much air getting under the cars) and a huge wing in the back to push the back end down and hold the car to the track at speeds necessary to win in NASCAR. The two engineers were working independently of each other when they pitched the solution. I interviewed one of them later. Despite the obviously outlandish nature of the proposed features, Chrysler racing gave the go-ahead. Engineers and technicians mocked up nosecones and wings and tested them at the Chelsea Proving Grounds. When they found combinations and shapes they liked, they sent them out for wind tunnel testing at two facilities. At one they used scale models and at the other they used full-sized cars lowered in through the roof. After extensive testing, they developed the shapes that ended up being on the Charger Daytona which debuted at Talladega in the Fall of 1969. One of these cars had the fastest qualifying time NASCAR had seen to date; another won the race. A winged car was the first to run a documented 200 MPH lap on a NASCAR track. Later, Bobby Isaac took a Daytona to Bonneville and set more than two dozen land speed records for a stock-bodied car. All of those races and records were run with that “idiotically-ineffective” wing on the back. 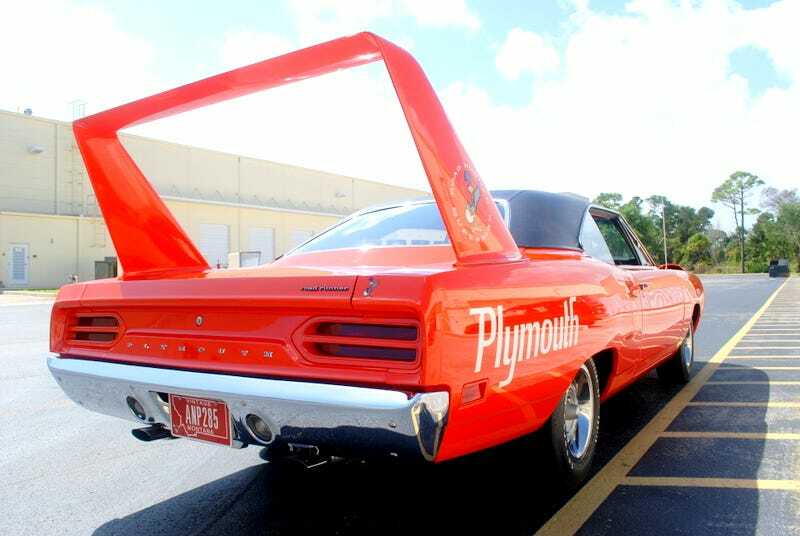 In 1970, Plymouth would add the aerodynamic treatments to a Road Runner, calling it the “Superbird.” That would be the car that Carlyle disparaged. But was the wing functional? Or was it just a “dumb” appendage that Chrysler stuck on the back of the car because American car buyers are stupid and think cars that “look like rocket ships are awesome”? Two engineers who worked on the program wrote a paper for the Society of Automotive Engineers and presented it to a packed house at Cobo Hall in Detroit in January, 1970. I admit, I am not an engineer. So I don’t know what some of this means. And all of the cool schematics you see here are from that SAE article. There are more - many more - along with charts and graphs that probably mean something to engineers. But I think it is safe to assume that the wing did something and it was not “idiotically-ineffective” or “dumb.” The wind tunnel testing predicted the effectiveness of the wing and the real-world results proved it. And that would be the same wind tunnel testing Carlyle touts as being partly responsible for the current field of knowledge in automotive aerodynamics. In fact, one of the paper’s authors, Gary Romberg, would later be granted US Patent #6588287, “Multiple stage system for aerodynamic testing of a vehicle on a static surface and related method.” That system is used in a wind tunnel. The Charger Daytona first raced in the Fall of 1969 and was joined in 1970 by the Plymouth Superbird. By the end of that year, NASCAR outlawed the cars, more or less, and the winged car era was over in NASCAR. Carlyle might not like the way the car looks but don’t blame the stylists for that. Blame the engineers. They put that nosecone and “dumb” wing on for a reason: They helped the car go really fast and handle really well at high speeds. And that is not something to describe as “idiotically-ineffective.” To say otherwise is dumb. Top photo by author; all other illustrations and the wing quote are from The Aerodynamic Development of the Charger Daytona for Stock Car Competition, Society of Automotive Engineers, paper no. 700036, by R.P. Marcell and G.F. Romberg (1970).